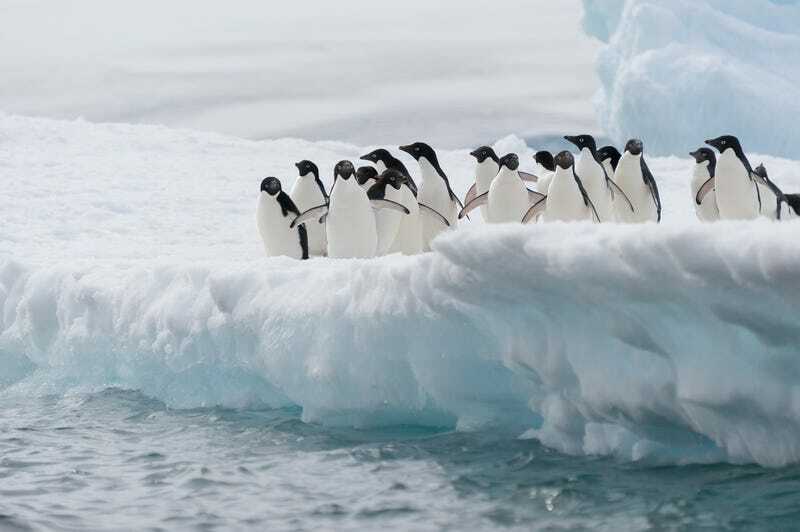 The population of a colony of Adélie penguins located in Commonwealth Bay, Antarctica has steeply fallen following the arrival of a massive iceberg, which has dramatically changed the local conditions favorable to the birds. In a study published to Antarctic Science, the 2010 grounding a 100 km2 iceberg, dubbed BO9B, has allowed for the creation of an ice sheet that remains in the area year-round. The abrupt change in terrain has spelled doom for thousands of the birds, which rely on open water to feed. Now, they must travel a long distance to find food: over 60 kilometers. Just over a century ago, the area was home to an estimated 200,000 birds (although the study notes that this might be an over-estimate). However, it doesn’t appear that the iceberg is responsible for 150,000 deaths, as has been widely reported. In 2011, scientists counted 12,834 pairs of the birds. The authors of the paper, returning to the area two years later, counted only 5,520 occupied nests, with the number of birds estimated to be in the low thousands. The stranding of giant icebergs in the southern Ross Sea that blocked the Adélie penguin’s approach paths to their colonies, thus increasing the distance birds must travel to feed, had a greater effect on chick mass and breeding success than any other environmental parameter measured (Dugger et al. 2014). In that study, penguin pairs that utilized cracks in the sea ice successfully fledged chicks while those where one or both members of the pair resorted to the 60 km commute across the fast ice failed (Dugger et al. 2014). The team believes that barring a mass-migration or elimination of the ice, the colony will decline to nothing in the next 20 years. Follow the author on Twitter at @andrewliptak.